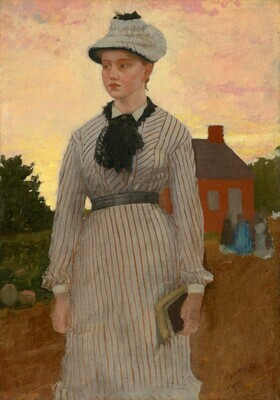 Shown nearly full-length, a young schoolteacher fills the foreground of The Red Schoolhouse. Standing on a wide dirt path or road, she gazes off to her right with a solemn expression, holding two books in her left hand and the striped fabric of her flounced skirt in her right. Around her neck the teacher wears a lacy triangular shawl known as a fichu that appears to be fastened with a square gold brooch or button. Her black and white ruffled bonnet is similarly elegant. Though only roughly sketched, the building behind the central figure is recognizable as a small red schoolhouse toward which a trio of schoolgirls appear to be headed. The surrounding landscape, lush and green, is silhouetted against a wide expanse of sky that glows with the warm, bright colors of early morning. The Red School House is related to a series of school subjects that Winslow Homer painted from 1871 to 1874. Though he varied the composition and narrative emphasis across the series, three elements remain consistent: a small red schoolhouse, its young female teacher, and a luminous mountain setting. Homer’s attention to this theme reflected a popular wave of nostalgia in late 19th-century America for small country schools and the simpler lifestyle they recalled. Part of a larger body of paintings of children completed in the 1870s, Homer’s school subjects, including #The Red School House, simultaneously express the country’s sense of optimism for future generations in the wake of the Civil War. Nellie C.M. Taylor [Mrs. George H. Taylor], Boston, in 1919. (E. & A. Milch, Inc., New York); sold 1919 to Gilbert E. Rubens [1884-1960], New York; (E. & A. Milch, Inc., New York); sold 22 November 1935 to Thomas Edward Hanley [1895-1969], Bradford, Pennsylvania; by inheritance to his wife, Tullah Innes Hanley, Bradford, Pennsylvania; (E. V. Thaw & Co., New York); sold 14 August 1970 to Mr. and Mrs. Paul Mellon, Upperville, Virginia; gift 1985 to NGA. According to Lloyd Goodrich's provenance, as supplied by Abigail Booth Gerdts, 16 September 1991 (in NGA curatorial files), "Mrs. Taylor is reported to have said in 1919, that her father acquired this painting directly from Homer." The painting was exhibited in Selections from the Collection of Dr. and Mrs. T. Edward Hanley at the Denver Art Museum from 22 February to 30 April 1968. Dr. Hanley died 9 April 1969, leaving his estate to his wife, Tullah Innes Hanley. "Hanley Leaves Art Works to Colleges and Museum," (The New York Times, 27 April 1969) states "T. Edward Hanley, the oil heir, left the bulk of his estate, valued at up to $15 million, to his wife, Tullah Innes Hanley." The collection presumably was dispersed according to his expressed wishes, but that dispersal evidently did not include The Red Schoolhouse. The painting was exhibited by Mrs. Hanley in the exhibition Works from the Hanley Collection at Canisius College in Buffalo from 23 November to 23 December 1969. A Loan Exhibition of Winslow Homer, Wildenstein & Company, New York, 1947, no. 16. Loan Exhibition of Paintings and Drawings from the Hanley Collection, Wildenstein & Company, New York, 1961, no. 20. T. Edward Hanley Exhibition, Fogg Art Museum, Cambridge, Massachusetts, 1962, no cat. Selections from the Collection of Dr. and Mrs. T. Edward Hanley, Gallery of Modern Art, New York; Philadelphia Museum of Art, 1967, repro. 17, 58. Selections from the Collection of Dr. and Mrs. T. Edward Hanley, Museum of the Southwest, Midland, Texas, 1967, no. 57. Selections from the Collection of Dr. and Mrs. T. Edward Hanley, The Denver Art Museum, Colorado, 1968, repro. 17, 58. Works from the Hanley Collection, The Columbus Gallery of Fine Arts, Ohio, 1968, no. 17. Works from the Hanley Collection, Canisius College, Buffalo, New York, 1969, no. 34. American 19th Century Paintings, Bernard Dannenberg Galleries, New York, 1970, no cat. The primary support is a very fine, closely woven fabric that has been lined but has cusping along the left edge. The double-layered ground consists of an off-white layer beneath an opaque gray-colored one that is allowed to show through parts of the finished painting and forms the body color of the dress. The paint surface is composed of multiple layers applied wet-into-wet and wet-over-dry with brushes and palette knife to create a smoothly textured surface with areas of impasto. The sky was laid in two layers, the second partially obscuring an earlier signature. The painting is in very good condition, despite small areas of paint wrinkling, especially in the sky. The varnish has not discolored. Hendricks, Gordon. The Life and Work of Winslow Homer. New York, 1979: 94. Cikovsky, Nicolai, Jr. "Winslow Homer's School Time: 'A Picture Thoroughly National." In John Wilmerding, ed. Essays in Honor of Paul Mellon, Collector and Benefactor. Washington, D.C., 1986: 48, 56, repro. 52. Carren, Rachel Ann. "From Reality to Symbol: Images of Children in the Art of Winslow Homer." 2 vols. Ph.D. diss., University of Maryland, 1990: 1:52. American Paintings: An Illustrated Catalogue. National Gallery of Art, Washington, 1992: 203, repro. Kelly, Franklin, with Nicolai Cikovsky, Jr., Deborah Chotner, and John Davis. American Paintings of the Nineteenth Century, Part I. The Collections of the National Gallery of Art Systematic Catalogue. Washington, D.C., 1996: 305-309, color repro. Goodrich, Lloyd, and Abigail Booth Gerdts. Record of Works by Winslow Homer, vol. 2. New York: Spanierman Gallery, 2005, no. 424. Kelly, Franklin. "A Lasting Legacy: The Completion of an Unparalleled Gift." National Gallery of Art Bulletin no. 51 (Fall 2014): 4, repro.